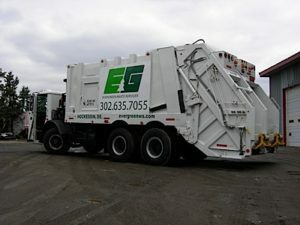 Evergreen Waste Services is a locally owned and operated recycling and hauling company servicing New Castle County, Delaware. As a community oriented company, we are dedicated to providing efficient and economic waste hauling service to our customers. Please take a moment to browse through our site to learn more about our company and the services we can provide. If you have any questions or comments, please feel free to contact us. We look forward to hearing from you!